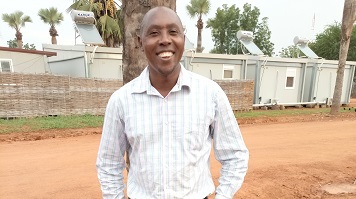 Working in Uganda as the head of the Research and Documentation department at an organisation called the Justice and Reconciliation Project (JRP), Owor Lino Ogora saw an advert for LSBU’s MSc in Education for Sustainability (EfS) and believed it would be highly relevant for his career. “Having obtained my first degree from Uganda, I was determined to get a qualification from an overseas university. LSBU happened to be the university offering the course advertised by the UK Commonwealth Scholarship Commission, and so I chose it,” he says. “I visited the website and was impressed with LSBU’s long history and tradition; that certainly influenced my final decision to choose it. Combining work at the JRP and study was very challenging, as my job involved working with people who had been displaced by the conflict in northern Uganda, but I somehow managed to juggle it successfully. Owor currently works as a civil affairs officer in the Civil Affairs Department of the United Nations Mission in South Sudan (UNMISS). South Sudan is still plagued by civil war, with many inter-communal and inter-ethnic conflicts continuing to destabilise the nation. “As a civil affairs officer, most of my work contributes towards UNMISS’ mandate of protection of civilians. I work with communities to conduct workshops and events on conflict management and conflict resolution, and provide support for the development of locally owned strategies to combat inter-communal and migration-related conflicts. Loving the freedom his work gives him to interact with communities, and the opportunity it presents for solving real-life situations, Owor is really enjoying his current role. “I spend more than half of my time out in the communities collecting information or conducting conflict management events. This gives me the opportunity to meet the people and hear directly from them, and get a first-hand understanding of their needs. Given that the minimum qualification for becoming a civil affairs officer with the United Nations Mission in South Sudan is a Master’s Degree, Owor’s qualification from LSBU definitely played a big part in him securing the role. He also believes that an added advantage was that the degree was from an outstanding university such as LSBU. “The EfS degree gave me a number of skills that I find extremely useful in my daily work. It was not only an opportunity to refresh, hone and improve my writing skills, but also an opportunity to pick up extra knowledge and skills that are helping me. I was able to significantly improve on my reflective writing, a skill I use today in reporting. I improved my research skills, a factor that helps me to collect much-needed information today. Using the skills gained in the course unit on values and participation, I am able to engage with the community and develop participatory mechanisms that take into consideration their cultures. The course unit on processes and management of change, meanwhile, helps me to envision the change I desire from the communities in which I work, and to work towards attaining it with the cooperation of the community members. In a nutshell, I use the skills gained on a daily basis as I execute my work.